We’ve all experienced that moment where we wish we could start all over again. Failed marriages, lost friends, addictions, lost jobs. This is not the life we imagined. Yesterday can sometimes leave us stuck, sad, shamed, scared, and searching. Sheila Walsh encourages readers to face the pain head on and then start again, from right where they are. She shares that when she discovered “I’m not good enough and I’m good with that,” everything started to change. 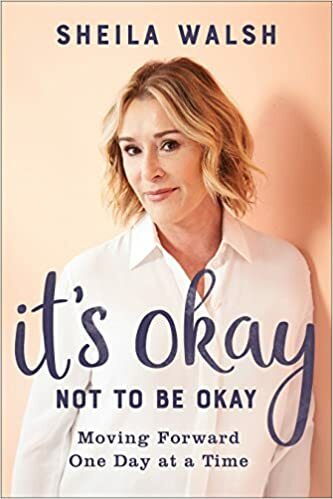 In It’s Okay Not to Be Okay, Walsh helps women overcome the same old rut of struggles and pain by changing the way they think about God, themselves, and their everyday lives. She shares practical, doable, daily strategies that will help women move forward one step at a time knowing God will never let them down. I really appreciated Sheila’s openness and honesty – she doesn’t have answers for everything, and that life is hard and disappointing and not what we imagined! But she also says that God is good and “we can trust Him even when we don’t understand where we are in life.” That it is okay to not be okay because that’s why we need Jesus. Yet she has struggled with this all her life. I really related to her when in the 1st chapter she talked about wanting to be Wonder Woman – yet fails to have devotions or is not a good wife or mother. Each chapter Sheila tells stories, of her failures or successes. She also adds Biblical stories and take aways. At the end of the chapter she has questions and verses to ponder. It’s not a long book, but one you will go back to receive encouragement. I highly recommend. I received a copy of this book from Bakerbooks. I am freely writing a review – all thoughts and opinions are my own. The Author:Sheila Walsh is an author, speaker and Bible teacher who has sold over 4 million books. Her heart is to show what happens when your real life meets the Word of God. She is the author of the #1 best-selling line of Christian books for little girls, “Gigi, God’s Little Princess.” Sheila is the creator of Children of Faith and the Gnoo Zoo, a ministry to children that communicates God’s love for them. She is the author of several books for women including “Honestly,” “Gifts for Your Soul,” “Living Fearlessly,” and “The Best Devotions of Sheila Walsh”, “The Shelter of God’s Promises” and her latest book, “God Loves Broken People and those who pretend they’re not.” As an accomplished musician, Sheila has recently released the CD “Beauty From Ashes.” Sheila, her husband, Barry and their son, Christian live in Dallas, Texas.